In short, episodes five through seven introduce the audience to a new core friend named Saki Yamagishi, to Fujimiya’s mother (and the story behind Fujimiya’s memory problem), and finally to Hase craving some alone time with Fujimiya and freaking out about summer vacation. This arc of episodes walks the series firmly into the realm of childhood friends and shifts the focus to youthful experience. This isn’t an unwelcome shift, and the series remains enjoyable—one simply needs to take One Week Friends as a generic story about friends rather than a story about friendship despite mental health challenges. 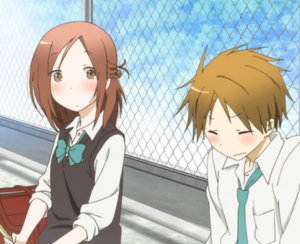 As far as Hase goes, it has been painfully obvious throughout the series that he has a rather significant crush on Fujimiya, but he hasn’t yet worked up the courage to confess. This adds a bit of adorable awkwardness to an otherwise drama-free series; Hase isn’t willing to push the topic, and Fujimiya remains too oblivious to pick up on clues from him or from nosy classmates. Fujimiya’s memory condition continues to decline in its impact, even though she continues to meet and interact with an ever-broadening group. This is passed off as due largely to her diary, which reminds her every Monday morning of the sorts of people she surrounds herself with. This is well and good, but early on in the series she mentions that keeping a diary hasn’t worked for her in the past, and I wonder if we’re waiting for the proverbial ‘other shoe’ to drop as a result. To some extent, I hope so. One Week Friends has the benefit of naturally-written dialogue and pleasant voice acting, but as of episode seven, the only serious conflict is that of Hase wrestling with his growing feelings for Fujimiya. This is standard anime fare, and in a story about overcoming challenges, learning to trust other people, and the tender moments of friendship, one would expect a tad bit more drama. On the other hand, the soft, simple episodes touch on childhood experiences that make me smile, and that’s not a bad thing, either. In fact, it means the series is growing on me. I am less concerned with the memory gimmick now, and more interested in the relationships between the characters, but the fact remains that Fujimiya’s memory problem comes off as a blunt narrative tool rather than a serious challenge. I have such mixed feelings about One Week Friends; I want to like it, but certain story choices really irk me. I’m hoping the latter half of the season will finally settle me to one side or the other.